Whether you’re a fan of Valentine’s Day or are impartial to the day, you may decide it’s right not to celebrate the holiday empty-handed. Although there are plenty of options you might present to your wife on Valentine’s Day, you can’t go wrong giving the timeless gift of flowers. In case you’re having trouble deciding what type of bouquet you might give to your loved one, we’ve compiled some tips and tricks and created a husband’s guide to picking the best Valentine’s Day Bouquet. When you are giving flowers as a gift to someone you know well, you might have a basic understanding of their likes and dislikes. Perhaps your wife adores peonies and detests daisies. In this instance, you might present your valentine with a bouquet that contains peonies by themselves or among other types of blooms. If you aren’t sure of your partner’s flower preferences, or simply want to present him/her with something different than what you might normally give, it’s always a good idea to stick to the Valentine’s Day classics: roses, tulips, lilies and carnations. There are several reasons why it’s important to take color into consideration when selecting flowers for this romantic holiday. For one, you’ll want to make sure you’re giving your valentine flowers they will love to look at. If they have an aversion to certain colors, or you fear that some hues might clash with your home’s decor, you’ll want to avoid the shades in question. As you can infer, presenting your loved one with a bouquet of yellow carnations is not ideal on Valentine’s Day. Instead, it’s best to stick with shades of red, pink and white when presenting a loved one with carnations. If you’d like to be more traditional, you might give your valentine a bouquet of roses. Like carnations, roses have different meanings based on their shades. While we all know that red roses are a Valentine’s Day staple, you might not realize that other rse colors perfectly fit the bill. On the holiday dedicated to romance, it seems only right that you present your gift to your special someone in a thoughtful way. Make sure you include a note with the flowers that articulates how much you love her. In addition, situating them in a vase, rather than in an unattractive store wrapper, can help your gesture speak volumes. 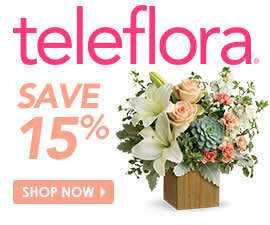 When you order your Valentine’s Day bouquet from Teleflora, we will hand-arrange the flowers and deliver in a beautiful vase that your valentine can keep and reuse for years to come. You can browse our Valentine’s Day bestsellers to find the right bouquet that will make your valentine’s day extra special.